For ages I was hugely frustrated with my drum sound. More and more EQ, more and more effects, tuning, more tuning, envelopes – I tried everything, or I thought I’d tried everything. The thing I was missing was bussing or grouping the drums all to one channel, and processing that channel. This gives the drums some sonic glue that brings them together, makes them cohesive, solid and chunky – more like a real drummer playing a kit in one sonic space, rather than disparate pieces of a kit that have no real relation to each other. If you apply a few effects to the channel you can quickly and easily bring all the drums together so they feel as if they are talking to each other. It also makes effecting all the drums really easy for filtering or other more flashy effects, and means you can turn all the drums up or down really easily as a group. There are some genres where this doesn’t work – you may want your kick drum separate in certain genres like house or techno, and if you are producing jazz this could sound heavy-handed but in the main, having the drums grouped together will really help your mix – if you’ve got a solid drum sound it becomes a lot easier to mix other elements around it. EQ. 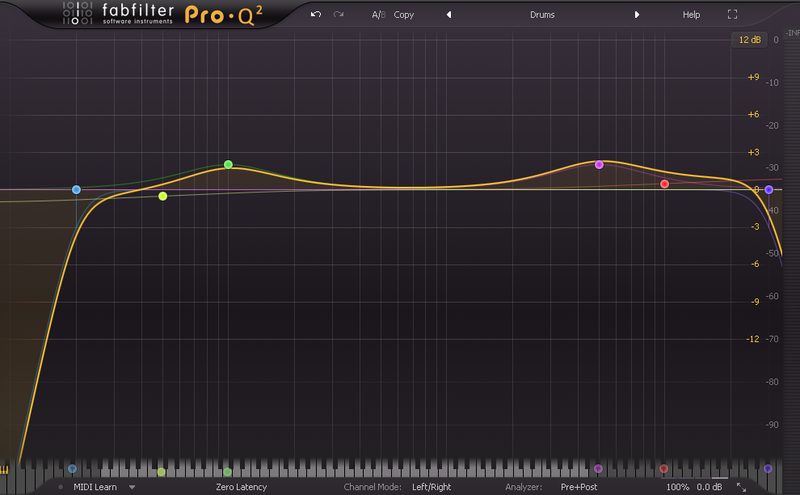 You’ve probably already EQ’d your separate drum sounds so they all sit in the right place, and that’s great. But EQ’ing them all together as a group really helps to bring them together. Gently boosting the lows (where the kicks and snares sit) and the tops where the hats are will make the drums sound brighter, chunkier and more present. The drums preset in Fabfilter Pro-Q is a great starting point – you may want to tune the low boost (at 100hz by default) to your kick and snare, and sweep the top boost (at 5khz by default) to accentuate the sizzle of your hats. Compression. I’ve been using the excellent Bus driver recently and I was using the Variety of Sound Density MKIII before that. The aim for me here is to just gently squeeze the drums together, removing at max a couple of dBs from the overall drum mix. All of a sudden it sounds more consistent and a lot fatter. Less is more with this step, you should be looking to reduce the dynamic range by 2dBs in total. Saturation. I’m a complete sucker for saturation, and it’s one of the rare effects that seems to make nearly any sound just a bit better, whether running it really hot or just introducing the tiniest amount of subtle distortion. The tape setting in izotopes trash 2 is great, sound toys decapitator is awesome, and if you are on a budget the Variety of Sound TesslaSE works a charm. 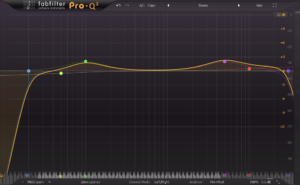 Once you’ve applied the EQ, Compression and Saturation the drums should be sounding a lot better, but you don’t have to stop here – you could apply more precise effects depending on the sound you are after – parallel compression to get them pumping, transient shaping to bring out the transients for snappier drums, or even to reduce the transients if you want a more subtle and rounded sound. If you aren’t grouping and processing your drums together you should definitely try it, it’s a great trick that will suddenly make them sound a lot more cohesive and solid.